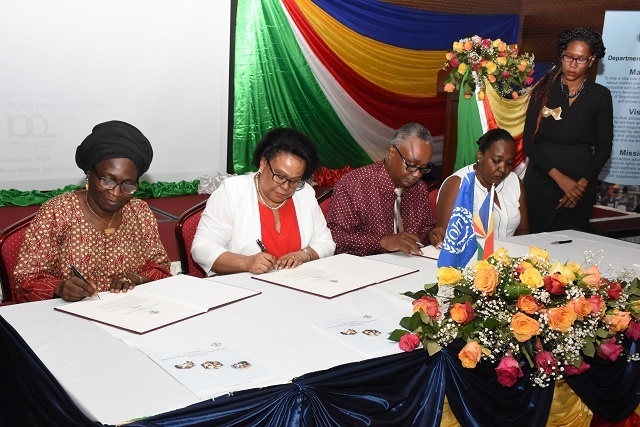 (Seychelles News Agency) - Seychelles signed a second ‘Decent Work Country Programme’ with the International Labour Organization on Wednesday with the aim of ensuring and creating a better working environment in workplaces. She said that the first programme helped promote the concept of ‘Decent Work’ and equality for all in workplaces in Seychelles, a group of 115 islands in the western Indian Ocean. The Decent Work Country Programme is the main mode of delivery for the support ILO gives to countries. One of the basic objectives of the programme is to promote decent work as a key component of national development strategies. Seychelles has made a lot of progress in its commitment to promoting decent work. These include the introduction of a 13th-month of pay, an unemployment relief scheme for vulnerable groups and an increase in maternity leave from 14 to 16 weeks. Telemaque said that the second programme will mean more positive changes in the employment sector. “It represents our willingness as national tripartite constituents to uphold our achievements and work harder for a common cause. It reaffirms the country’s confidence in the aims of the decent work agenda and sustainable development goals for our society,” she said. A sum of $880,000 (SCR12 million) has been earmarked for the second programme which starts next year and ends in 2023. According to Cynthia Samuel–Olonjuwon, ILO assistant director general, the new agreement serves as a key medium for a supportive, inclusive and sustainable development initiative that is anchored on the notion of decent work. “We need to look back on the different achievements we have made and see if we can embellish it to get a better result. Nevertheless, we also need to look at the different challenges, and how we have been able to surpass it if we again want better results,” Samuel–Olonjuwon. On his part, Antoine Robinson, secretary general of Seychelles Federation of Workers Union, said he welcomes this second initiative and is proud to be part of. The first ILO programme in Seychelles started in 2011 for three years but was extended to 2017.